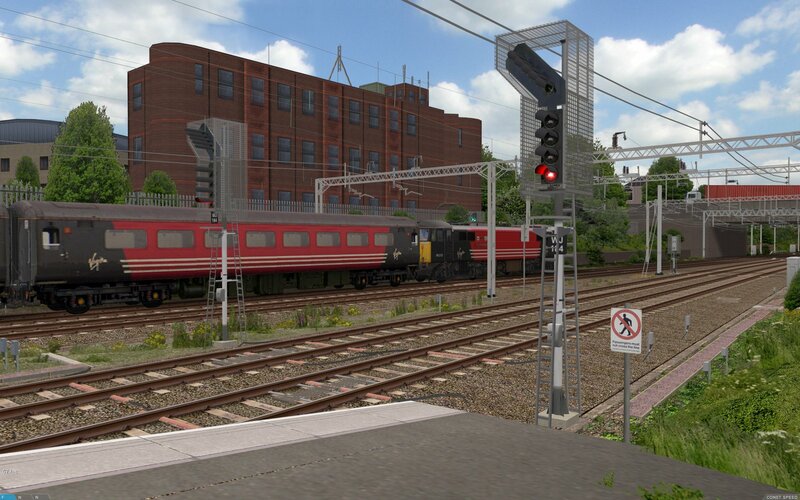 On this page, you can read some background information about the Watford Junction to Rugby project, see photos of the real line, view screenshots, learn of it's history, find out how to drive the simulated route, and read information about the real-life line. You can follow progress with the project as it's being developed, via the Railsimroutes.net Blog. Watford Junction to Rugby forms part of the southern section the West Coast Main Line (WCML), which is one of the UK's most important routes with frequent inter-city and commuter services. The WCML is also a priority Trans-European Networks (TENS) route, and one of the busiest freight routes in Europe. Watford Junction lies in the county of Hertfordshire, and the station is the first major stopping point for inter-city services out of London's Euston terminus. Watford Junction is an interchange between the West Coast Main Line, the Watford DC lines operated by London Overground, and the St. Albans branch line. 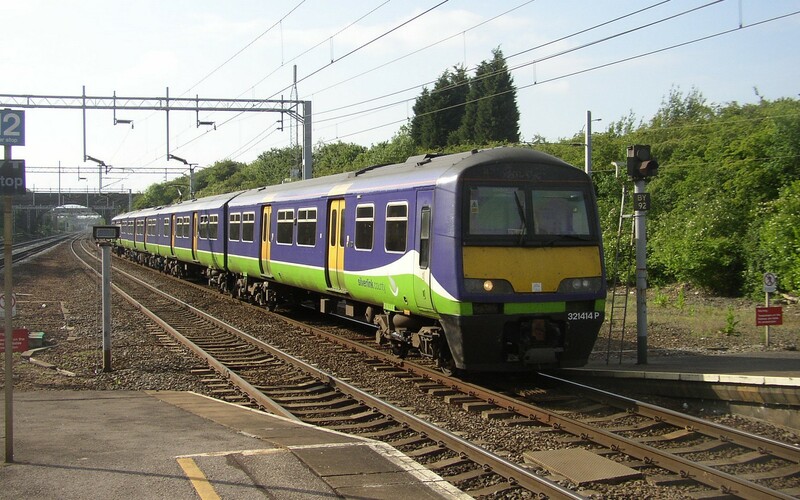 Rugby is a town in Warwickshire, south east of the UK's second city, Birmingham, and Rugby is where the West Coast Main Line's Weedon and Northampton lines converge. Rugby is also the station where the Trent Valley Line serving Nuneaton, Tamworth and Rugeley, and the Stour Valley Line serving the cities of Coventry, Birmingham and Wolverhampton, diverge. Between Watford and Rugby, the WCML is a four track railway throughout, with fast and slow lines side by side, except for the section between Roade and Rugby, where the slow lines veer off to the town of Northampton. North of Watford, the WCML passes through various towns and villages, including Apsley, Kings Langley, Hemel Hempstead, Berkhamsted, Tring, Cheddington, Leighton Buzzard, Bletchley, Milton Keynes, Wolverton, and onwards to Rugby via the Weedon Loop. 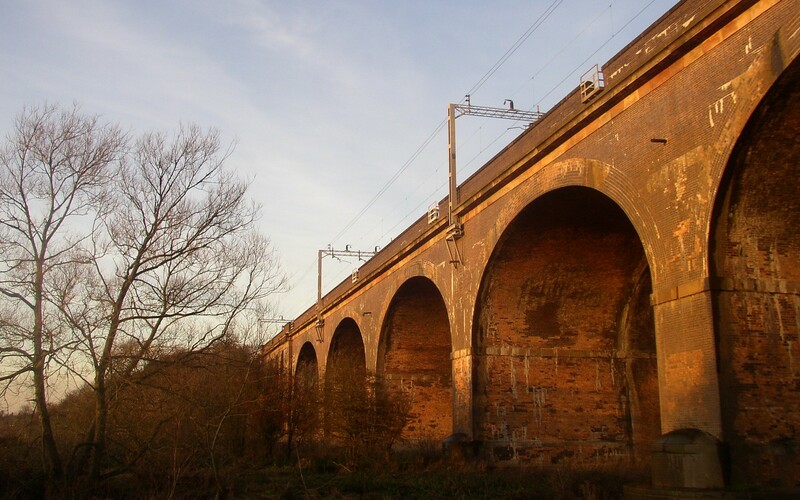 The WCML was built in the 1800s, with Watford Junction to Rugby being a section of the London and Birmingham Railway. The route features some interesting engineering achievements, such as Roade Cutting, and Kilsby Tunnel. Roade Cutting is now a Site of Special Scientific Interest (SSSI) for geological reasons, and the cutting itself is unusual in that the cutting is deep with the fast and slow lines on different levels, with the slow lines enclosed within a cage-like structure to prevent the retaining walls from collapsing in on the tracks. Kilsby Tunnel (see right), was designed and engineered by Robert Stephenson, and built in 1838. The tunnel is 1 mile 656 yards / 2.22 km long, and features two large ventilation shafts. There are other interesting landmarks too, such as the famous radio masts of the Rugby Radio Station at Hillmorton, south of Rugby, and the Great Ouse viaduct north of Wolverton (see right). In recent years, the WCML has been upgraded significantly via the WCML Route Modernisation programme (WCRM), and at immense cost, although the upgrade is not as significant as originally hoped for. Overhead line equipment has been upgraded, with the 1960s Mk1 catenary system being converted to the new UK1 standard. This involved replacing the contact wire and droppers, many of the insulators and isolators, and replacing registration arms with a new lighter weight design. Track was also renewed, with old sleepers, track fasteners and BS113A rails being replaced with UIC60 rail and Pandrol Fastclips, installed on the fast lines and elsewhere. 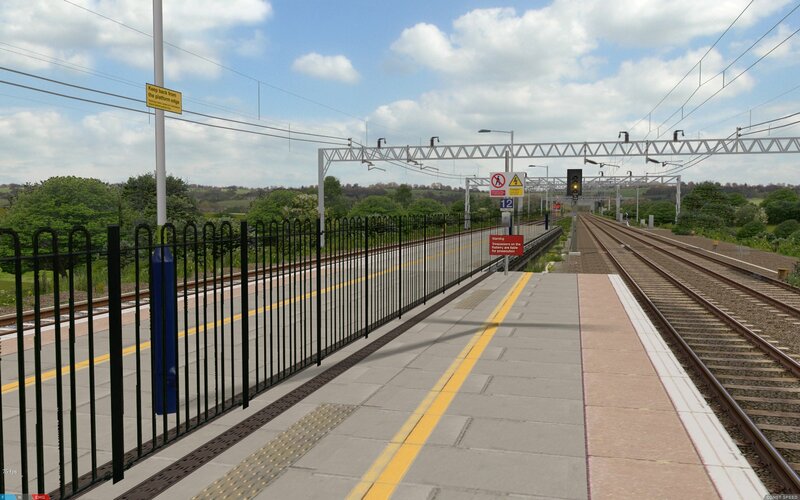 The southern section of the WCML was also used as a testbed for some new technology, including new 60 mph pointwork and junctions installed at Ledburn and Bourne End, using the newly designed High Performance Switch System (HPSS) point machines. 1960s signalling was also renewed or replaced entirely, with different signal spacing to accomodate 125 mph linespeeds and braking distances, and overhead masts repositioned or redesigned to increase signal sighting distances. 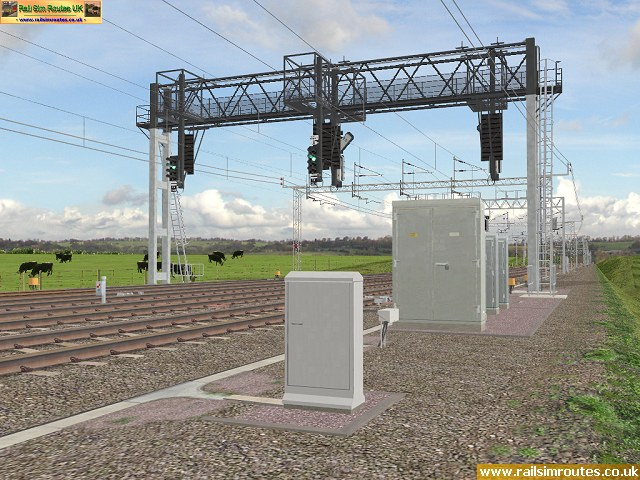 Newly designed Light Emmitting Diode (LED) signal aspects were also introduced initially between Leighton Buzzard and Rugby, and traditional track circuits were also replaced with newer axle counter technology. Adoption of ETCS (European Train Control System) was originally considered as part of the WCML Route Modernisation Programme, enabling 140 mph linespeeds, but the viability of installing the system on the complicated West Coast Main Line hadn't been assessed fully, and the WCML route modernisation as a whole was proving very costly. Therefore, this was dropped and linespeeds remain at 125 mph, and the class 390 Pendolino's top speed capability remains unrealised in service. To download this route (when it's available), please visit the Watford Junction to Rugby downloads page. The class 390 is available now, however. Watford Junction to Rugby is an evolution of the Watford Junction to Milton Keynes Central (WJ-MKC) route, released in August 2001 (the release announcement is still available via the news archive). The route was an add-on written in the .RW and .B3D format for version 2 of mackoy's BVE Trainsim, and was one of the first long distance UK routes to be released for BVE. 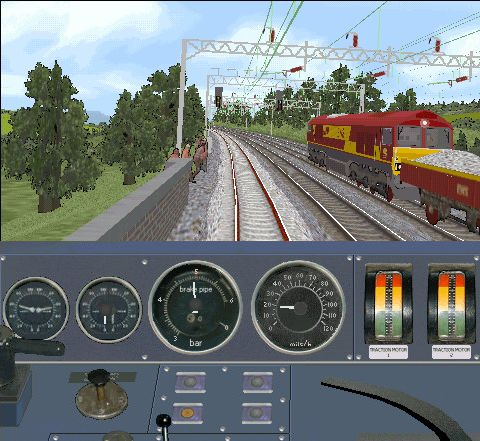 A class 87 25kV AC electric locomotive was also developed for the route, this being a collaboration between myself and Paul Robins, the developer of the Train Driver 3 simulation for the Commodore Amiga. Paul was also extremely helpful in assisting me with the route. Upon the release of WJ-MKC, the project was a success because of it's detail and realism (by the standards of the day), and the good performance BVE 2 users saw while using it. BVE v1 and 2 had a limited resolution; the 3D viewport itself was only 480x240 pixels, and the cab panel was only 480x200 pixels orignally, hence the poor visual quality of the old WK-MKC route by today's standards. Left: WJ-MKC v1 (BVE Trainsim v2.6)... Right: Watford Jn. to Rugby (openBVE). WJ-MKC itself started life as the "WJ-MKC Demo", containing the section from Watford Junction to Apsley. This was my first ever attempt at a route, started in December 2000, and was designed for BVE v1. However, the demo was, in contrast to the final release, a disaster. This was because I'd been over-ambitious and the route's objects were too geometrically complex, and BVE 1 just couldn't handle the objects I'd developed. The failure was caused by my inexperience at developing objects (I'd started developing the route within a month of discovering BVE in 2000), but also because of some serious pausing and stuttering problems with BVE 1's renderer, which occured without much provocation. BVE 2's renderer was somewhat better performing than BVE 1's, but it was also with help from another of the early UK BVE developers, Robert Glass, that I learned how to optimise object geometry by eliminating duplicated vertices wherever possible (I dubbed this "meshbuilder merging"). This is partly why WJ-MKC, and later the Birmingham Cross-City South, have been successful and performed well on people's computers. Since then, I went on to turn efficient object creation into something of an artform, which resulted in the complexity of the objects shown today in the Watford Junction to Rugby project, which would undoubtably suffer worse framerates without this efficient and thoughtful object creation process. The WJ-MKC demo also provided me with a useful testbed for working out how to get transparent textures to render in a suitable way depending on what graphics card BVE was being run on, as on ATI and NVIDIA cards, my original textures were completely invisible, while on my Voodoo 5 card, they displayed as expected. I had to offer "ATI and GeForce Texture Patches" for users with cards from these two popular manufacturers. 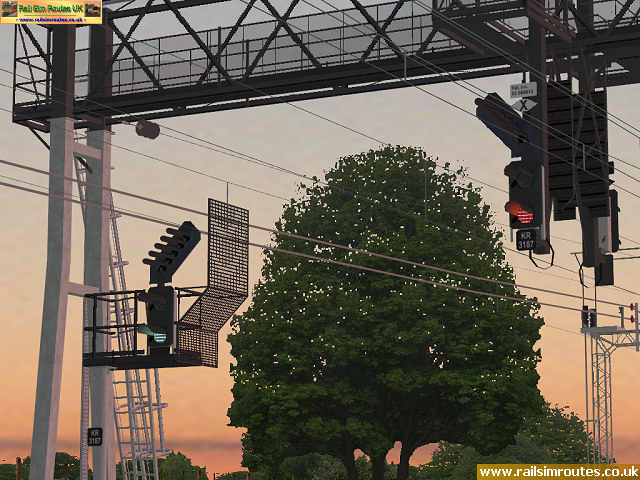 In October 2001, the route was updated with some new effects, dubbed "graduated lighting effects", by Bryan Dudley. This introduced the idea of using "black fog" to recreate night-time within BVE, which itself had no customisable lighting options at that time. By periodically adjusting the fog along the route, the effect of a gradually darkening scene could be created. WJ-MKC was updated to version 1.1 in February 2002, with some bug fixes and photo-realistic backdrops provided by Bryan Dudley. 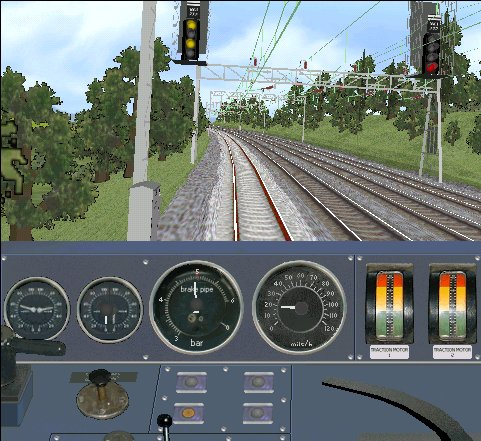 In March 2002, BVE v2.03.0008 allowed "full height" 480x440 pixel cab panels to overlay the 3D viewport, and the class 87 was updated with a full height panel and "animated" controls, which at the time, improved immersiveness considerably. 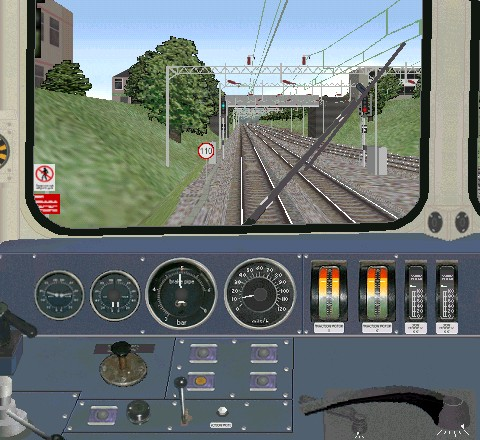 In April 2002, Steve Green (trainsimcentral.co.uk) developed a class 321 EMU, and WJ-MKC was updated again (by Steve) to make use of the new unit. In June 2002, together with Steve, I launched the BVE Track Sound Standard (BVETSS), which defined a list of preferred track running sounds which main line routes and trains could use, with the aim of increasing route and train interoperability, and ensuring that the correct track sounds would be played when any BVETSS compliant train and route were used together. This was the last update for WJ-MKC, and the BVETSS has been adopted by UK mainline route and train developers ever since. 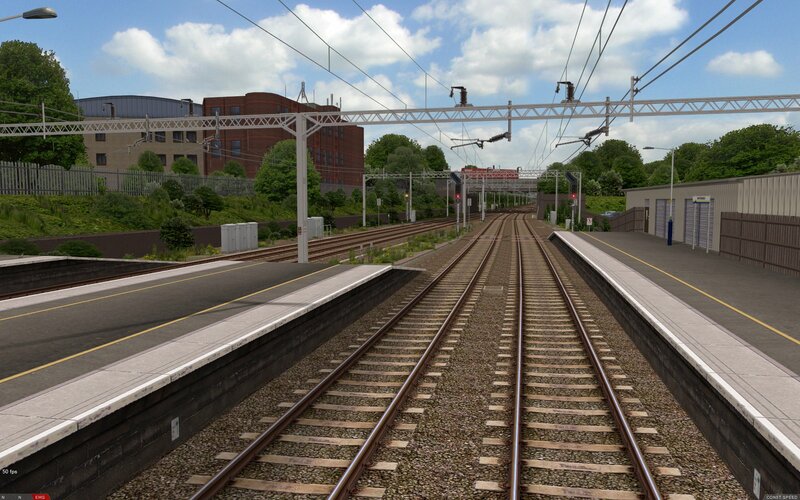 In September 2002, I announced the development of Watford Junction Milton Keynes Central version 2, as even then, I acknowledged that the route looked dated, especially in comparison to my recently released Birmingham Cross-City South project. At the time, I'd converted the route from the .RW/.B3D formats to the .CSV format which BVE 2 supported, and rewritten parts of the route file to increase it's accuracy and realism. I'd also upgraded from Windows 98 to Windows XP by this time, and discovered that BVE 2's renderer curiously ran much more smoothly and with greater fluidity under the Windows XP or 2000 operating systems, than it did under Windows 98. This allowed me to create more detailed and complex objects without this move resulting in BVE's infamous stuttering and pausing problems, at least when BVE was run under Windows XP or 2000. I added more detailed scenery and more trees, created higher resolution track textures, and upgraded the catenary to make it more sophisticated. Subsequently, I released Birmingham Cross-City South v1.2, and work I did with this Cross-City South update acted as a testbed for what I wanted to add to WJ-MKC version 2. In 2004, I made a crucial design decision which I had hoped would enable me to create a wonderfully detailed and accurate route, while still being usable with BVE's limited rendering capabilities. I wanted to model the route with a far higher level of detail, down to differences between individual signal gantries, point motor and backdrive configurations, location specific catenary details, and so-on. For example, almost every signal gantry along the route is different in some way, and I wanted to model these differences. Taking a large, complicated signal gantry object and duplicating the whole thing, so that I could have different signs, or altered locations or designs of signal post telephones at each site, seemed like a very inefficient way to do things, as each object would be both large and almost identical, leading to lots of duplicated data across all the object files. Instead, I decided to split such complex objects up into their component parts, so that nothing was duplicated, while I could then rebuild the entire signal gantry installation from it's component parts via route file commands, and reposition and reconfigure the re-assembled installations, as per their real-life counterparts. Initially this worked very well, and I was able to both increase visual detail, and prototypical accuracy, while still having BVE's renderer cope with these improvements. I then started implementing the same principle to every kind of object in the route -- catenary, pointwork, lineside features, etc... I spent my time checking the results, foolishly, only via mackoy's Track Viewer utility, which never seemed to slow down much, and so I carried on until I'd converted the entire route, and significantly increased it's detail and accuracy beyond anything I'd done before. What I didn't realise, was that at some point during this extensive conversion process, BVE 2.9 which had been released by that stage, began to exhibit a rather annoying problem. With each session, initially upon loading the route in BVE 2.9, rendering of the route was smooth, framerates were quite acceptable, and I was pleased. But then, as I drove further into the route, BVE 2.9 started to stutter slightly. The further I drove, the worse this stuttering became, until it became pausing, and eventually the renderer froze completely for a period of many seconds, before unfreezing again afterwards, followed by the same smooth > stutter > pause > freeze pattern repeating itself over and over again, throughout the route. I discovered that by bringing up BVE 2.9's About dialog box periodically, this annoying behaviour could be largely avoided, and smooth performance could be maintained with this little bit of frequent "maintenance". I discussed this problem with Simon Gathercole (developer of the plugin DLLs used by many UK BVE 4 trains), and we figured that by pausing the simulation, perhaps it gave BVE 2.9 time to "garbage collect" as it's known in .NET terminology, and this was perhaps why smooth performance could be recovered. I assumed that this was a problem which could be fixed, not with my route, but with BVE's code instead, and indeed I let BVE's author know about this problem. So I continued developing Watford Junction to Rugby, hoping BVE's problems would be resolved. Sadly, they weren't, and the situation actually worsened when BVE 4 was released, as even the About dialog trick no longer worked as a means to recover smooth performance. By this stage, I'd done too much work on Watford Junction to Rugby to reverse the design decisions I'd made, so I began to realise that the project wasn't viable any longer. The solution was to decrease the detail and prototypical accuracy of the route, but whenever I start a new project, my aim is always to produce something which is an improvement over what has come before it, and creating a route with lower detail than even Cross-City South, and less accurate as well, is the opposite of what I wanted to achieve. Instead, I made the rather crazy decision of carrying on with the project, even though I knew it could never work in BVE 4. I figured that the only thing I had to lose was time, so instead, I went overboard and started creating ridiculously detailed 3D models which were so comprehensively modelled and geometrically detailed, that they couldn't be easily improved upon in future, beyond updating the textures. 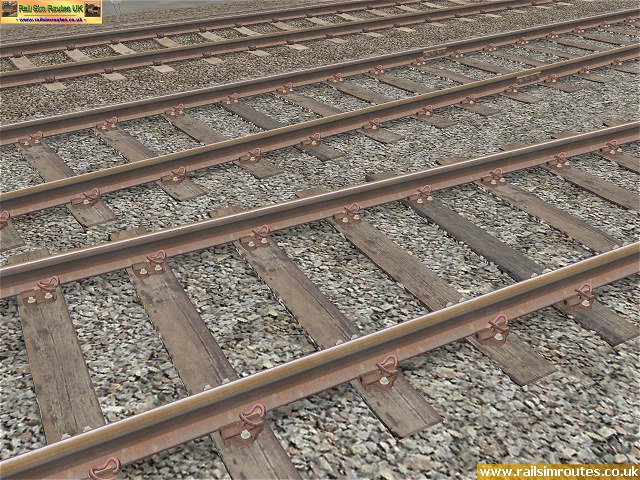 This way, they would always have some value, even years into the future, as they could always be exported to other 3D model formats and used in alternative train simulators, especially as 3D hardware improved. However, I had also hoped that one day, someone might come along and develop a new simulator with a much better renderer, which was also capable of loading BVE's route and object formats, which might revive the Watford Junction to Rugby project as a whole. During 2005, I made a great deal of progress with the route, but I also realised that my hope wasn't likely to be realised any time soon, so I effectively abandoned development for BVE, and thought I'd never return. 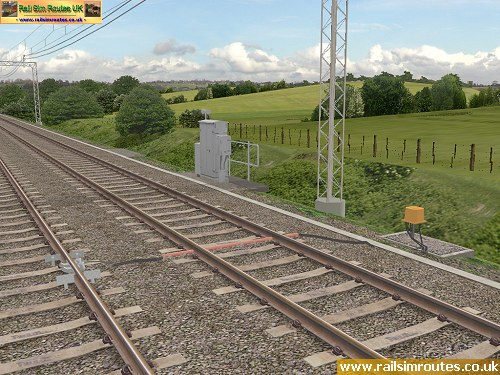 I did actually do some more work in 2007, such as adding 3D vegetation and grass to the route's embankments, and modelling some more of the changes which had taken place on the real WCML, but I felt that showing the screenshots and a new video of this work was the only way that I could share what I'd created at the time, and I also felt that these developments were likely going to be the last work I did on the route. In 2008, a highly gifted programmer by the name of Michelle appeared, and she started the development of the openBVE project. openBVE turned out to be even better than the program I had dreamt about three years earlier, and to my amazement and relief, openBVE was able to handle Watford Junction to Rugby and it's geometrical complexity with relative ease, even though the program was also written using a .NET programming language (C#), just as BVE 4 had been (VB .NET). The only feature I had to remove, was the inclusion of 3D rail fasteners, but these are hardly important from within the cab, or indeed when good sleeper and rail textures are used. Even better still, the program was open source, so it could be modified or improved by anyone at any time, and was also written by a developer who the English speaking community could communicate and work with as the program developed. 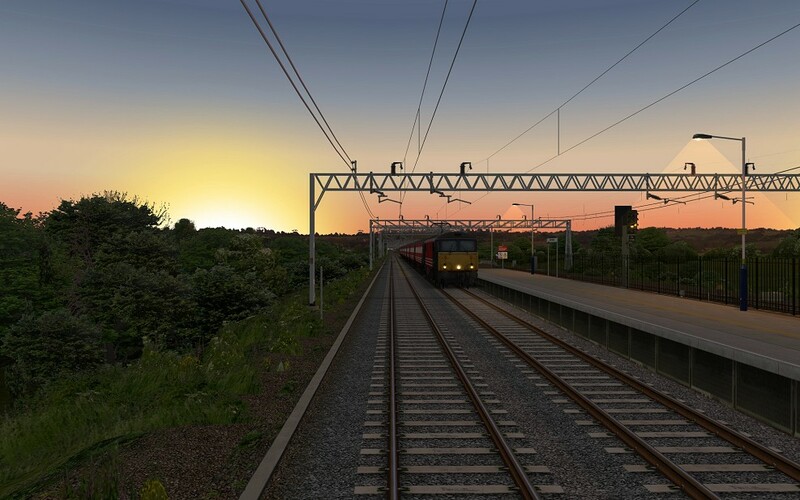 Thanks to openBVE and Michelle, I've now been able to develop Watford Junction to Rugby into what you see in the screenshot gallery above, and the image below shows the remarkable evolution of the route, from it's humble beginnings as WJ-MKC, to what it is today, and will be when it's finally released (running smoothly at 67 fps with a resolution of 1920x1200, with better image quality as well).